We take great pride in announcing that we are one of the noted service providers engaged in offering Hardness Testing Services that are used for determining the hardness of a wide variety of material. 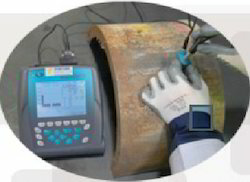 We use digital and portable Hardness Tester to measure the hardness of the specimen. - Major loads for Rockwell test 60, 100 & 150 Kg. - Major loads for Superficial Hardness 15 , 30 & 45 Kg. 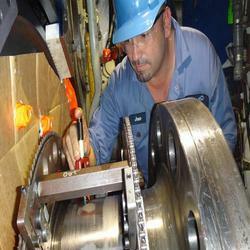 We are involved in providing our customers highly qualitative Hardness Testing Services. These services are offered in agreement with the defined guidelines to preserve our standing in the industry. To add, the employees rendering these are appointed after stern analysis of their experience. With thorough knowledge of the industry, we are engaged in offering services for Digital Hardness Testing Services. Our professionals utilize advanced machines a follow industry guidelines while rendering these services. Hardness Testing Services is technology that measures a material’s strength by determining resistance to penetration. The hardness test is extremely useful in material selection because it provides a hardness value which indicates how easily a material can be machined and how well the material will wear. Hardness testing is also valuable in making decisions about treatments and coatings.